I’ve been making up stories ever since I can remember. There was a period in high school when I wanted to become an author, but I decided instead to pursue a career in science. Still, I never stopped writing creatively as a way to escape and pass the time. Well, I am of course very proud of Eolyn, now available from Hadley Rille Books, and its companion novel High Maga, which will be released next spring. The best short story I’ve written is ‘Creatures of Light’. It’s a crazy mix of romance, natural history, and dark fantasy. The main character, Selenia, is a brilliant and ruthless anti-heroine. When I finish the trilogy for Eolyn, I intend to write a new set of novels based on this short. If you’d like to check out Creatures of Light, the Amazon link is http://www.amazon.com/Creatures-of-Light-ebook/dp/B00AP91X84/ At the very least, have a look at the cover design; it’s lovely! The list is endless, but here are a few: Grimm’s Fairy Tales, The Little House series (all of them!) by Laura Ingalls Wilder, The Once and Future King by T.H. White. In high school I read a lot of historical fiction and historical romance, as well as science fiction and some fantasy. Many of those titles I no longer remember, but I suspect they still influence me today as a writer. There have been so many, it would be impossible to list them all here. J.R.R. Tolkien has inspired me just as he has inspired every author of fantasy. I am also very fond of the work of the Nicaraguan author Gioconda Belli, particularly The Country Beneath my Skin¸ her memoir of the Sandinista revolution in Nicaragua. Among historical fiction authors, my favorites include including Halide’s Gift by Frances Kazan and Lady of the Rivers by Philippa Gregory. I also love reading history, particularly women’s history. Some books that have stuck with me from this genre are Elizabeth: The Struggle for the Throne by David Starky, Murder of a Medici Princess by Caroline P. Murphy, and The Tigress of Forli by Elizabeth Lev. In the genre of fantasy, I have very much enjoyed the novel series A Song of Ice and Fire by George R.R. Martin (although I have not yet read the fifth book). I also really like Patricia McKillip, especially her novel Winter Rose. My list of favorite novels would not be complete without mentioning T.H. White’s The Once and Future King, from which I drew much inspiration when I was writing about Eolyn’s and Akmael’s childhood. My favorite genres are historical fiction and history. Although I do not pick (or refuse) books by their genre, these are the two I keep coming back to. The Country Beneath My Skin by Gioconda Belli. There is not genre I avoid conscientiously, but if I pick up a book and am not captured as a reader by the first chapter or two, I put it back down. Life is too short to spend time reading books I don’t like. I grew up in a bi-cultural family. My mother is from Germany. My father was born in the U.S., but also has German relatives. So, we spent a lot of time between Germany and my home town of Overland Park, Kansas, when I was growing up. It was during our summers in Germany that I learned a fascination for castles and medieval landscapes; and that, I’m sure, is where Eolyn was born. Having grown accustomed to traveling, I made a career of it. 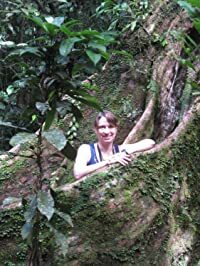 As an ecologist, I’ve worked mostly in the tropical forests of Central and South America. That is how I met my husband, who is Costa Rican. At the moment, we live our lives between his home town of Heredia, Costa Rica and where my family currently resides, in Kansas City, Missouri. Everywhere. Everything. Any moment, person, or place can inspire a story. That’s why it’s important to live in the real world if you want to write about an imaginary one. This is kind of an unfair question for someone who has managed to write and publish and get to the marketing stage. Because I’ve been successful at writing and publishing, I would say of course that marketing is the hardest, because this is the challenge I’m currently dealing with. But writing is very hard work – especially in the opening stages when you are trying to find your voice, figure out your story, and nail down the basic elements of the craft. And finding a publisher through the traditional route, which is what I chose to do, is no piece of cake. Truth be told, it is all hard, but also very rewarding. As long as you approach the business of writing with a lot of patience, persistence, and a clear sense of where it all fits in the larger context of your life, you can be happy as a writer.